The main difference between striated non striated and cardiac muscles is that striated muscles are cylindrical, non-branched, multinucleated muscles with alternative light and dark bands while non-striated muscles are long, non-branched, uninucleated muscles without alternative light and dark bands and cardiac muscles are cylindrical, branched, uninucleated muscles with faint bands. Furthermore, striated muscles are voluntary muscles while non-striated muscles and cardiac muscles are involuntary muscles. Striated, non-striated, and cardiac muscles are the three types of muscles, which make up the muscle tissue of animals. Striated muscles are the skeletal muscles attached to bones and tendons. The main function of striated muscles is to help the skeletal movement during locomotion and the movement of body parts. Also, these muscles are voluntary muscles, which means their control is conscious. The contraction and relaxation of striated muscles are short, intense bursts. As a percentage of mass, an adult male has 42% of striated muscles in the body while an adult female has 36% of them. Furthermore, a striated muscle is made up of thousands of cylindrical cells that are striated. Here, the repeating functional units called sarcomeres are responsible for the striation of the muscle, forming an alternative pattern of dark and light bands on the muscle cell. Additionally, these muscle cells have numerous mitochondria and glycogen granules to produce energy. On the contrary, both cardiac muscles and pharyngeal muscles, which are a structure seen in the embryonic development of vertebrates, are also considered as striated muscles. Non-striated muscles are the smooth muscles found in the walls of internal organs including esophagus, stomach, intestines, bronchi, uterus, urethra, bladder, blood vessels, etc. Generally, they are involuntary muscles whose contractions are controlled by the autonomic nervous system, hormones, and intrinsic factors in the organ. Therefore, they are a type of involuntary muscles. Moreover, non-striated muscles are made up of long, unbranched muscle cells that have a single nucleus. Based on the form of contraction, there are two types of these muscles as single-unit and multiunit smooth muscles. Here, the contraction of single-unit smooth muscles occurs as a whole bundle. However, these muscle cells contain lesser amounts of mitochondria and glycogen granules. Cardiac muscles are the muscles in the wall of the heart. Same as non-striated muscles, the autonomic nervous system is responsible for the regulation of muscular contractions in cardiac muscles. Therefore, they are a form of involuntary muscles. Generally, the muscle cells of cardiac muscle are cylindrical and branched cells. Their branches connect to each cell in irregular angles. The overlapping regions of muscle cells have finger-like extensions in the cell membrane known as intercalated disks. The gap junctions present in the intercalated disks allow the passage of electrochemical signals among cells. Therefore, several nearby cardiac muscle cells contract together. Also, cardiac muscle contains a special type of cells known as pacemaker cells, allowing the unique, rhythmic contractions of the muscle. Striated, non-striated, and cardiac muscles are the three types of muscles in animals. They are made up of different structures of muscle cells. Furthermore, the two main forms of proteins in these muscles are actin and myosin. Also, based on the structure and the type of nerve innervation, these muscles have specialized functions in the body. However, the main function of these muscles is to maintain posture and movement of body parts and the internal movements of organs. Striated muscles refer to the muscle tissue that is marked by transverse dark and light bands that is made up of elongated fibers and non-striated muscles refer to the smooth, thin muscles that are not controlled voluntarily while cardiac muscles refer to a specialized form of striated muscle occurring in the hearts of vertebrates. Thus, this is the main difference between striated non striated and cardiac muscles. Striated muscles are also known as skeletal muscles, and non-striated muscles are known as smooth muscles while cardiac muscles are known as heart muscles. Striated muscles are the cylindrical, non-branched, multinucleated muscles with alternative light and dark bands while non-striated muscles are long, non-branched, uninucleated muscles without alternative light and dark bands. Cardiac muscles, in contrast, are the cylindrical, branched, uninucleated muscles with faint bands. Hence, this is an important difference between striated non striated and cardiac muscles. Another difference between striated non striated and cardiac muscles is their ends. Striated muscles have blunt ends; non-striated muscles have tapering ends while cardiac muscles have flat and wavy ends. 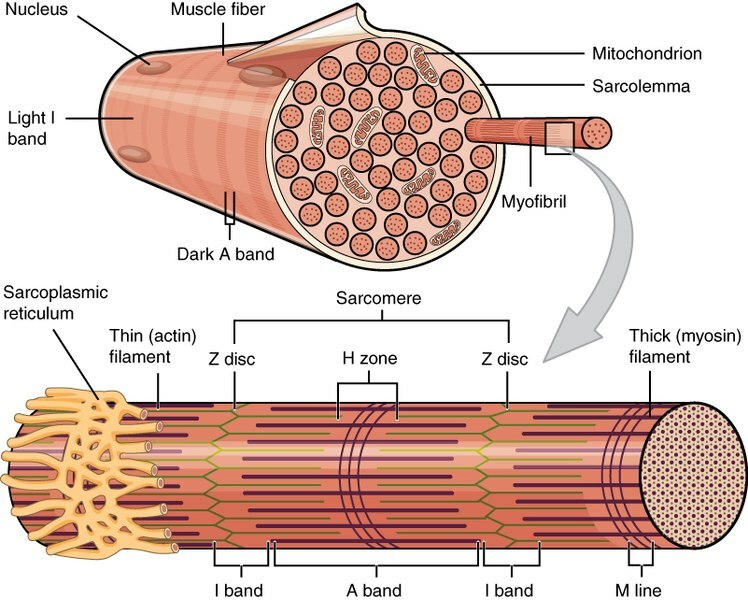 Furthermore, striated muscles have regular, parallel bundles of muscle cells while non-striated muscles do not have a regular arrangement of muscle cells; cardiac muscles have muscle cells that connect at branching, irregular angles. So, this is also a difference between striated non striated and cardiac muscles. Also, striated muscles occur attached to the bones and skin while non-striated muscles occur in the walls of internal organs and cardiac muscles occur in the wall of the heart. Additionally, while striated muscles show voluntary muscular movements, both non-striated and cardiac muscles show involuntary muscular movements. Besides, striated muscles are under the regulation of the nervous system while both non-striated and cardiac muscles are under the regulation of both nervous and endocrine system. Moreover, their energy requirement is one other difference between striated non striated and cardiac muscles. Striated muscles have a high energy requirement and non-striated muscles have a low energy requirement while cardiac muscles have an intermediate energy requirement. Striated muscles show fast contractions, non-striated muscles show slower contractions, while cardiac muscles show the intermediate speed of contractions. This is also a difference between striated non striated and cardiac muscles. Striated muscles show non-rhythmic contractions while non-striated and cardiac muscles show rhythmic contractions. Moreover, striated muscles increase the strength with the stretching and non-striated muscles release the strength with contraction while cardiac muscles increase the strength with the stretching. Striated muscles do not easily become fatigued, non-striated muscles easily become fatigued while cardiac muscles do not fatigued. Thus, this is another difference between striated non striated and cardiac muscles. In brief, striated muscles or skeletal muscles are the cylindrical, non-branched, multinucleated muscles with blunt ends. They are attached to the skeleton and are responsible for the movement of the body parts. Also, non-striated muscles or smooth muscles are long, non-branched, uninucleated muscles with tapering ends. They occur in the walls of internal organs and are responsible for the internal movement of organs. On the other hand, cardiac muscles are cylindrical, branched, uninucleated muscles with flat and wavy ends. They occur in the wall of the heart and are responsible for the rhythmic contractions of the heart. In addition, both striated and cardiac muscles contain alternative dark and light banding pattern while non-striated muscles do not. Moreover, striated muscles are voluntary muscles while both non-striated and cardiac muscles are involuntary muscles. Therefore, the main difference between striated non striated and cardiac muscles is their structure and function. 1. “Overview of Muscle Tissue Types|Lifetime Fitness and Wellness.” Lumen, Available Here.